This update is all about the projection variations obtained by Wagner’s transformation method called Das Umbeziffern. In case you don’t know what I’m talking about, I’ve written a lengthy article about it. 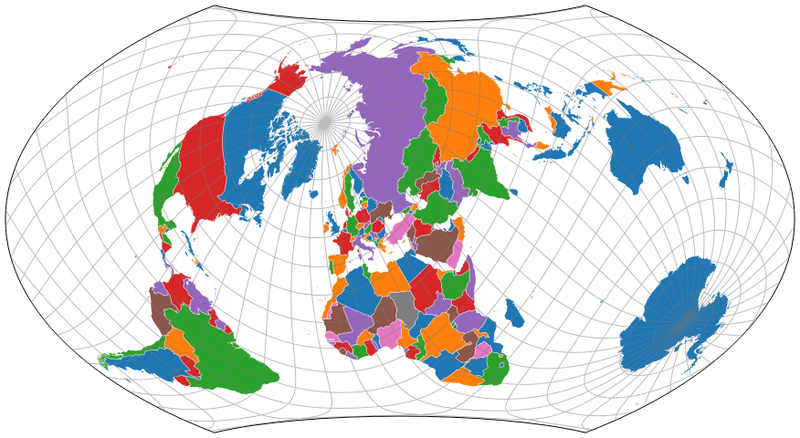 Version 3.2 of the commercial map projection software Geocart is now available. The update includes – among a lot of other new projections – the generalized Wagner which lets you generate customized maps using Wagner’s method. I think that’s worth mentioning because I wrote quite a lot about the Wagner variations here on map-projections.net. 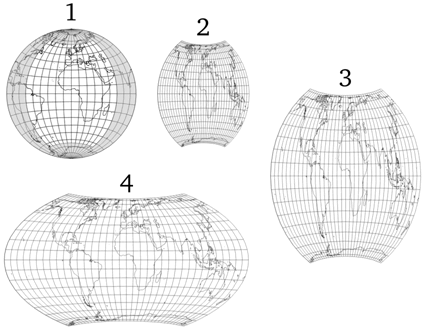 Moreover – and more importantly – because Wagner’s method now (77 years after its introduction and 33 years after his death) is applied systematically in a map projection software. At least, we get the Wagner projections the way they were meant to be! And yeah, of course, I’ve mentioned »the upcoming Geocart version« on several occasions, e.g. in the Sinucyli projection blogpost – so, now it’s available! 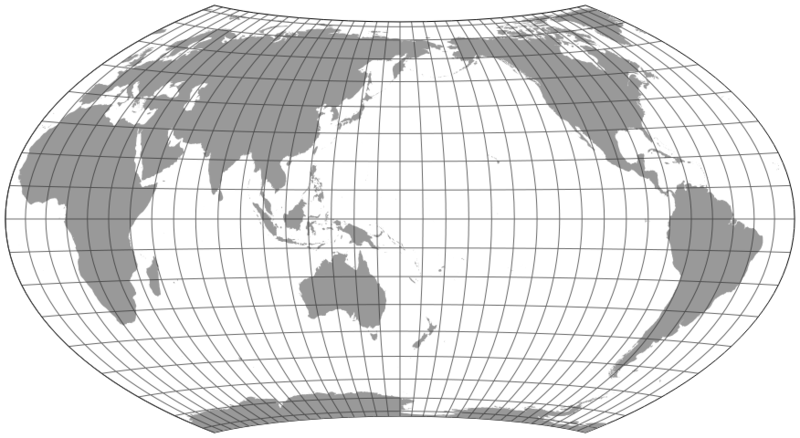 In the WVG, I use the d3js.org scripts to render the projections. This still is a preliminary solution, a proof of concept. So far, I didn’t check if it complies with the d3 coding conventions! But before I get to talk about the actual implementation, I’d like to address Wagner’s method of Umbeziffern briefly, so you can comprehend the parameters used in the script without referring to the detailed description. 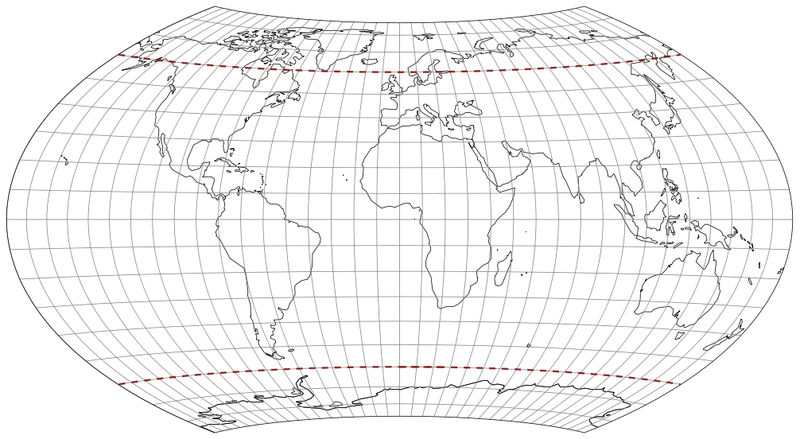 Wagner’s idea, presented in 1941, basically consists of using an existing »parent projection«, namely (in case of Wagner VII/VIII) the azimuthal equal-area projection in the equatorial aspect. and stretched horizontally to the desired ratio of the axes while maintaining equivalence. 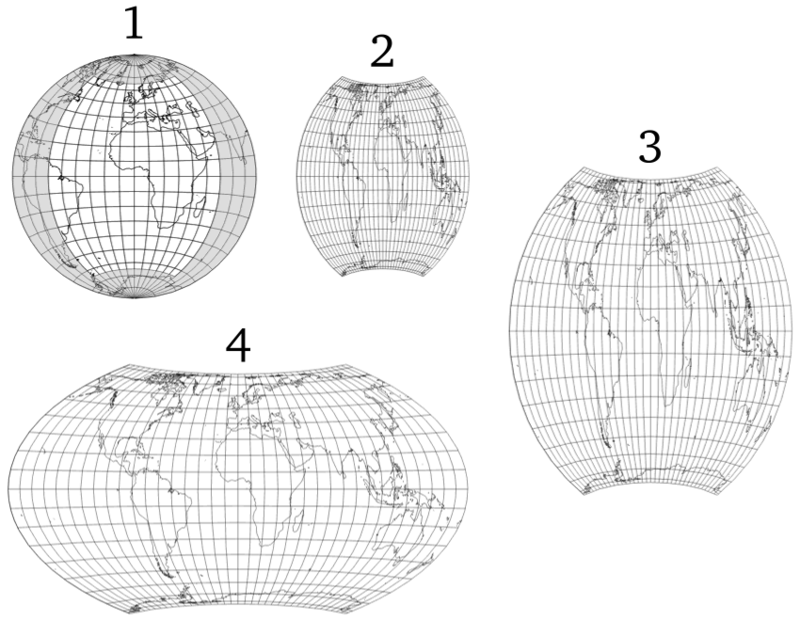 So now, be choosing the bounding parallels and meridians, the axial ratio and – in case you don’t need an equal-area projection – the amount of areal inflation you can generate a set of customized maps. For example, Dr. Rolf Böhm presented a variation in 2006, setting the bounding parallels to 65°, the bounding meridians to 84°, the areal inflation at 60° to 1.25, while the axes remain at the ratio of 1:2. 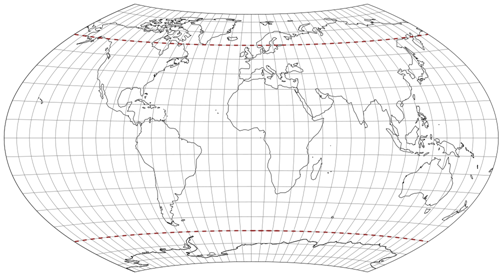 Thus, the result has a shorter pole line, a higher curvature of the parallels and a slightly increased areal inflation towards the poles than the Wagner VIII. Dr. Böhm also devised a notation to identify any given Wagner variant (and now, we’re slowly crawling towards my d3 implementation) by putting the five parameters that are highlighted above in a row. For the areal inflation and the ratio of the axes he chose to use percentual values so his variant reads: 65-84-60-25-200.
ψ1, λ̅1, φ1, S1 and p (using the same order as above). S1 sets the amount of areal inflation at the parallel φ1. As mentioned above, Dr Böhm decided to use a percentual value here, thus 25 means an areal inflation by the factor 1.25. 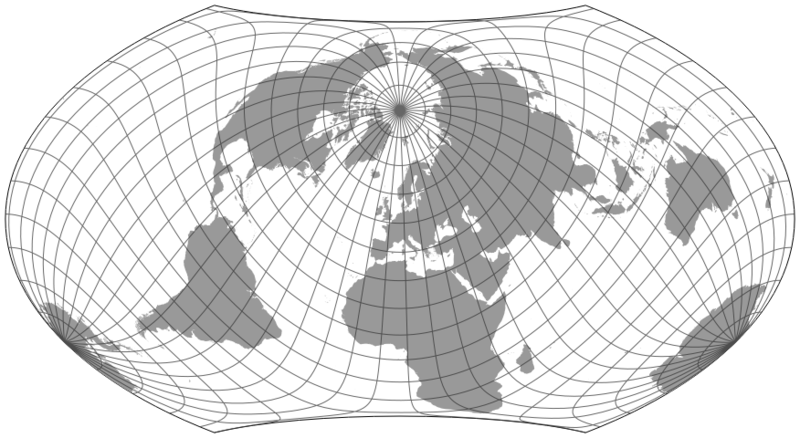 Min value is 0 (= equal-area projection), max value is < 100 (in my implementation: 99.999). finally, p sets the aspect ratio of the main axes and again is noted percentually: A value of 200 renders an equator that is twice as long as the the central meridian. p must be greater than 0, technically there’s no max value. Halfway sensible values are somewhere between 50 and 500. If I failed to explain the parameters comprehensibly, hang on a bit! There’s something coming up that should unconfuse you! In the d3 implementation, I’m using four of these parameters. Huh, four? What about the fifth? I decided to dismiss the parameter φ1, because you can write any desired areal inflation as value at 60° N/S: An inflation of 1.6 (or 60 using the Böhm notation) at 70° equals 1.32 (or 32) at 60°. For simplicity, I decided to always interpret the amount of inflation as »amount at 60° N/S«. Well, basically it was laziness because it eases validation of the input parameters a lot. Thus the parameter of areal inflation is here denoted as S60 to indicate that the value always refers to 60° N/S. While Wagner indeed worked with these input parameters, the values in the final projection formula are different. In the article I mentioned before, I called the values Cx, Cy, m1, m2 and n, following Gerald I. Evenden’s libproj4. For example, if you’d like to shorten the pole line, you’ll have to increase the value given at psi1(). Using the direct values for this, you’ll have to increase the values at cx() and m1 while at the same time, decrease the cy() value. However increasing the areal inflation requires you to modify the values for cx(), cy() and m1() again, and m2() on top of it. So it’s nigh impossible to predict which modification of which value will have which effect. That’s the advantage of my derivation of the Böhm notation: Here, each value effects one of the possible modifications. However it of course possible that someone prefers to work with the value that get inserted directly into Wagner’s formula, and that’s that the method geoWagner7CustomizableDirect() is for. I’ve provided examples including the full source code. The Static Examples 1 - 4 show the source code that is needed to make it work in the d3 scripts, in the Interactive Example you can explore the capabilities of Wagner’s method by dragging a few sliders. In case you’re feeling confused about the input parameters – this example should clear it all up!